This is Dark Chalk Paint Wax - Formally known as Soft Wax - THIS is a BROWN color..not black! Find BLACK Wax HERE. Again, SOft Wax and Chalk Paint Wax are the SAME product. Just new branding! 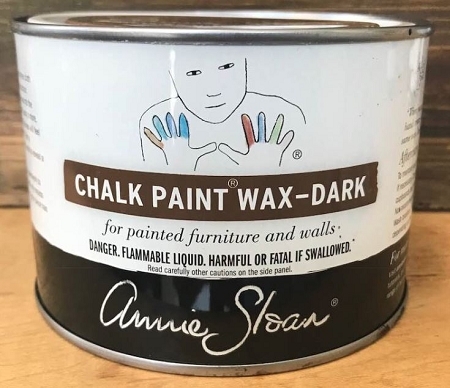 This is the LARGEST container of DARK Wax that Annie Sloan offers. To age and give texture to your paint. Apply the Clear Wax first - remove excess .......and then apply the Dark Wax. I typically apply the clear wax, remove the excess. Then, apply the dark wax. Make sure to read my post about dark wax regarding how to apply it properly! It is called, "Don't be afraid of the Dark" Click HERE to read it!!!! Wipe clean regularly and use a gentle spray cleaner for tough areas- but make sure it does not contain a de-greaser, which will hurt the wax. Also- with dark wax- be careful to not overly clean and lift off the dark. Also- we recommend ALWAYS using Annie's Wax with her Chalk Paint®! You can color the Dark Wax to make it less brown by using a little of our Annie Sloan Chalk Paint in the wax. Use Old White to make white wax or a bit of Annie Sloan Aubusson Chalk Paint to make the wax almost black. As noted in a post earlier, the waxes can become very soft in heat, so store them in a cool place. Note though that the heat or cold, will NOT ruin your wax! You can put in refrigerator for short time if needed. The wax is the consistency of soft butter. 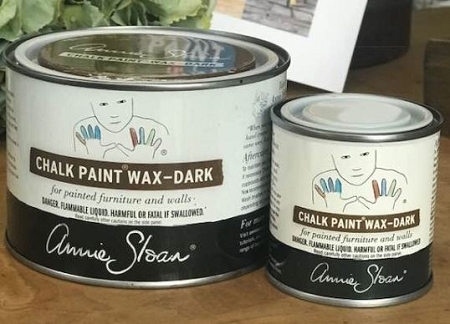 Consider taking a class from a stockist to learn all the ways to maximize using your Annie Sloan Dark Wax or for more terrific project ideas, we highly recommend Annie Sloan's book, "Quick and Easy Paint Transformations". It contains 50 Chalk Paint projects that will inspire and instruct you.